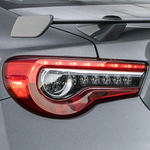 Toyota 86 | Del Toyota Inc.
Toyota's Scion FR-S has now become the Toyota 86. There have been a number of upgrades and updates on this latest model and you get only the best when it comes to exterior styling, power under the hood, comfort and safety. We recommend this vehicle to many of our customers here at Del Toyota Inc. and everyone drives away very happy with their purchase. The interior of the Toyota 86 is covered with a faux-suede product that is very unlike what you will find in other sporty models on the market right now. You will find other sporty features like a leather wrapped steering wheel, contrast stitching on the rest of the materials and much more. The central infotainment system on the Toyota 86 is very easy to use and houses many great features such as your navigation system, your audio sound system and other interior controls. Stop down to Del Toyota Inc. today to find out more!